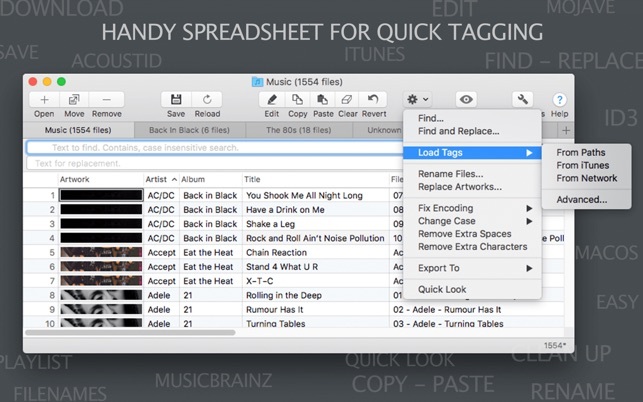 Tag Editor is a handy spreadsheet for batch tagging and renaming audio files. You can download music metadata and album art from the network; load tags from files, paths, and iTunes; rename multiple files simultaneously; edit, cut, copy, paste, find and replace tags. All these batch actions can be done in one window using keyboard shortcuts and with full control over your changes. Trial version is available at amvidia.com/tag-editor . 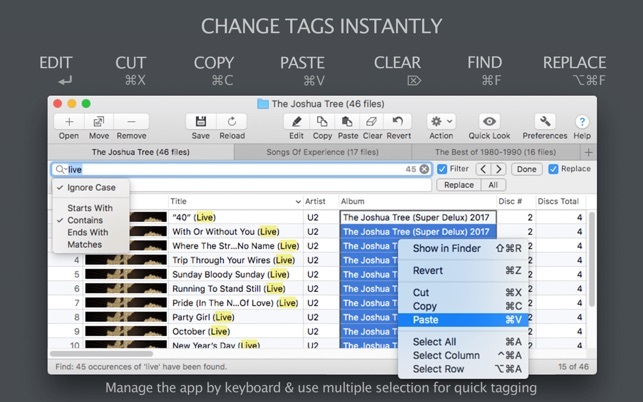 Tag Editor supports ID3 tags for MP3, WAV, AIFF, FLAC formats and MP4 tags for MP4 and M4A (Apple lossless) audio files. You can edit and load 60+ audio tags, including Album, Album Artist, Artist, Artwork, Comment, Copyright, Disc Number, Genre, Grouping, Key, Lyrics, Title, Track Number, Year, and others. For your convenience, thematic tags are organized into sets of Classical, Commerce, Mood, People, Podcast, and Sorting. Filenames can be changed in auto or manual mode as well. 15+ technical properties, such as Audio Format, Sample Rate, Bit Rate, Channels, and others can be displayed and used for creation of tags. DOWNLOAD TAGS FROM NETWORK: select multiple tracks or entire sheet and load tags from online databases, such as MusicBrainz and CoverArt. You can specify whether to load missing tags or update existing metadata. Tag Editor can identify songs by their fingerprints with use of AcoustID online service. LOAD TAGS from file names, paths, and iTunes: Tag Editor can extract audio tags from files, folders names, and iTunes library. RENAME FILES using Track Number, Artist, Title, Album Artist, Album and Year tags. 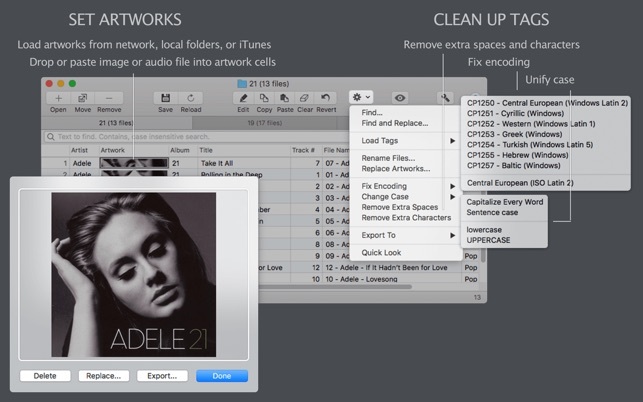 LOAD ARTWORKS from network, paths, and iTunes to save time searching for cover art. REMOVE EXTRA CHARACTERS option helps to remove characters like leading digits, text in brackets, and punctuation characters at the start and at the end of tags. PARSE ITUNES, M3U, XSPF, PLS, ASX, WPL playlists and CUE sheets to open related audio files automatically. To open an iTunes playlist just drag it into Tag Editor window. TO CONVERT ITUNES RATINGS AND PLAYS into standard tag format select Rating and Plays columns in Tag Editor and choose ‘Edit’ > ‘Load Tags’ > ‘From iTunes’. 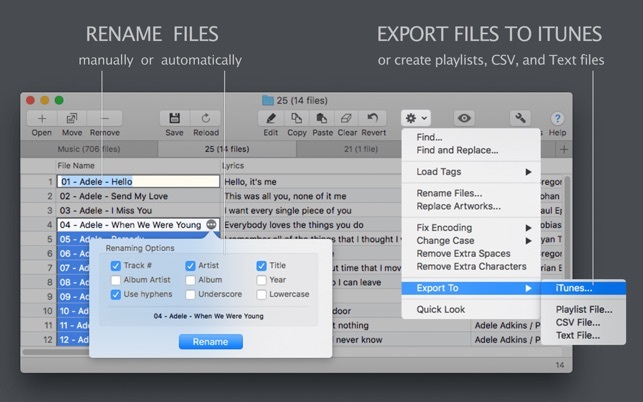 TO EXPORT FILES TO ITUNES OR PLAYLIST just choose a related command in ‘File’ > ‘Export To’ menu. EDIT, CUT, COPY / PASTE, CLEAR using single or multiple-selection. FIND / REPLACE through the entire sheet or within a selection. TO SET ALBUM ARTWORKS just drop or paste an image or an audio file into selected Artwork cells. RENAME FILES by typing required name in the cells. FIX ENCODING feature makes tags readable. You can choose suitable encoding in ‘Edit’ > ‘Fix Encoding’ menu. CUSTOMIZE COLUMNS with ‘View’ > ‘Column’ and rearrange them to see required tags & file properties. 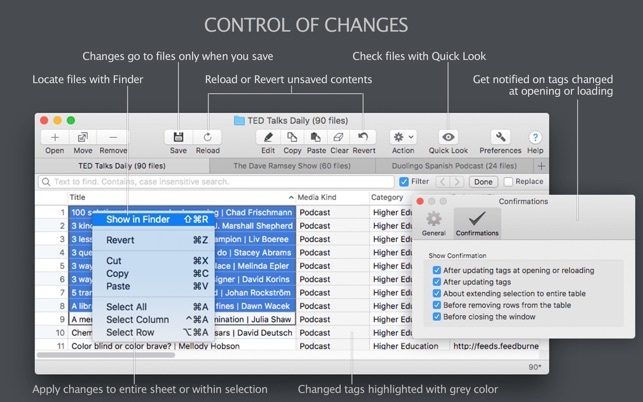 MANAGE ROWS by sorting, filtering, and moving them between windows and tabs. SELECT single cell, multiple cells, columns, rows or entire sheet to apply changes. CONTROL ALL CHANGES using Revert and Save commands. LISTEN to TRACKS within the editor using Quick Look. USE FULL-SCREEN MODE to utilize all desktop space. USE KEYBOARD SHORTCUTS to manage the app. Please, email to support@amvidia.com about feature requests or any problems. We always glad to improve our applications for your needs. If you like the Tag Editor, a review on the App Store would be very appreciated. • New columns of commonly used audio tags, such as Lyrics, Rating, Tracks Total, Media Kind, Category, Is Compilation, Language, Plays, Radio Station, and Tags. • New columns of other tags are split into Classical, Commerce, Mood, People, Podcast, and Sorting thematic sets for your convenience. • Classical tag set includes 25 tags, such as Composer, Conductor, Movement, Orchestra, Opus, and others. • Podcast tag set includes Podcast Category, Media Kind, Description, ID, URL, and Podcast Date tags. • Commerce tag set includes ASIN, Bar Code, Catalog #, Copyright, ISRC, Publisher tags. • Mood tag set includes BPM, Energy, Genre, Initial Key, and Mood tags. • New tags in People set are Arranger, Choir, DJ Mixer, Engineer, Ensemble, Lyricist, Mixer, Original Artist, Original Lyricist, Performer, Producer, and Remixer. • Sorting tag set includes 12 most popular sort tags, as Sort Artist, Sort Album, and others. • Columns showing file properties and audio properties are combined into two corresponding sets. Audio Properties set and File Properties set can help with music organizing by displaying up to 15 technical, mostly read-only, attributes. • Import of iTunes playlists with drag-&-drop. • Import of iTunes Rating and Plays and their conversion into standard audio tag formats. 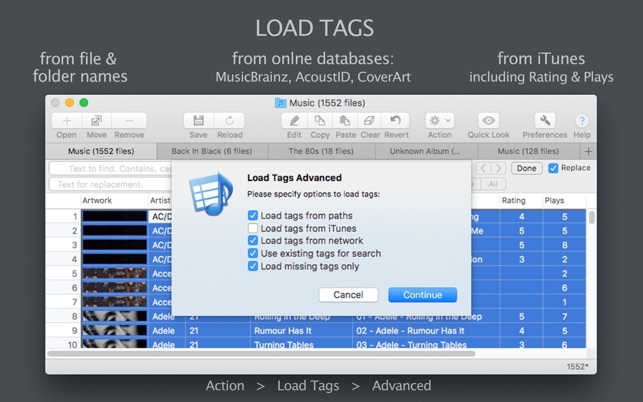 • Loading of tags from iTunes. • Export to iTunes playlists. • Import of M3U, PLS, XSPF, ASX, WPL playlists. • Import of CUE sheets. • Export to M3U, PLS, XSPF, ASX, WPL playlists. • Export to CSV and Text files. • Genre, Mood, Media Kind, and Language columns allow predefined values selection. For example, Genre column contains ‘Blues’, ‘Brass & Military’, ‘Children’s’, ‘Classical’, ‘Electronic’, ‘Folk, World & Country’, ‘Funk / Soul’, ‘Hip-Hop’, ‘Jazz’, ‘Latin’, ‘Non-Music’, ‘Pop’, ‘Reggae’, ‘Rock’, and ‘Stage & Screen’ predefined values. To select a predefined value click round button in a cell and choose the value from the list. • Window tabs on macOS 10.12 and higher. 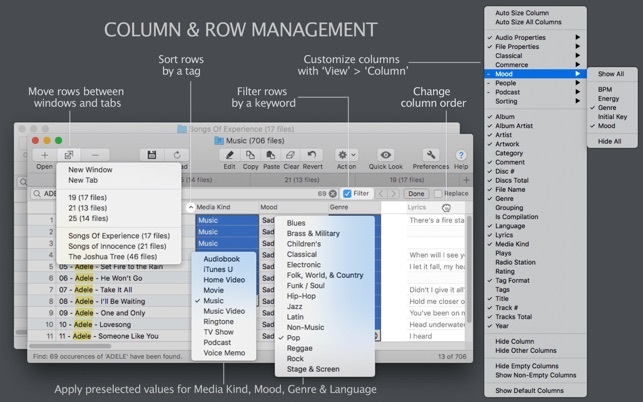 You can move rows between tabs to help you better organize your music. For example, you could separate an artist tracks into tabs for each artist album. • New commands ‘Hide Empty Columns’, ‘Show Non-Empty Columns’, and 'Show Default Columns' for easier column management. • Text mode for the toolbar. • Improved loading of tags from the network. • Improvements and fixes for cut/copy/paste functionality. • Improvements for the toolbar. Wer Tags schnell und unkompliziert bearbeiten möchte ist bei dieser App genau richtig. Intuitiv einfach zu bedienen, schnell und zuverlässig. Ich habe erst die kostenlose Version eine Weile getestet und dann gerne gekauft, weil die Qualität stimmt. Ich bearbeite damit Tags für meine iTunes-Sammlung (Mobile Musik für Unterwegs) als auch für meine Musikbibliothek auf einem NAS, in der die Masse der Dateien im Flag-Format abgelegt sind. Wer schon mal mit iTunes seine Musiktitel mit dem internen Editor (Informationen) getagged (etikettiert) hat, der weiß wie mühselig dies ist. Wer umfangreiche Musiksammlungen hat, kommt an diesem Tool nicht vorbei. Hervorragende tabellarische Bearbeitung aller Informationen (von Album über Cover bis Jahr), d.h. eine Spalte markieren in einer Zelle den neuen Eintrag vornehmen und alle Titel bekommen diesen Wert. Ich habe meine 200GB umfassende Sammlung an einem Nachmittag überarbeitet. Copyright © 2019 Amvidia Limited. All rights reserved.